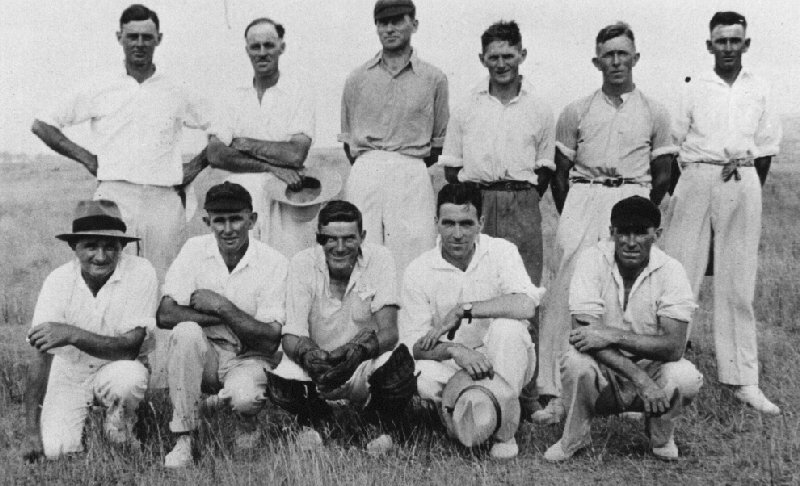 Carapook was no different to most small rural settlements in that they supported Cricket, Football and Tennis teams in the local Casterton & District Sporting Associations. 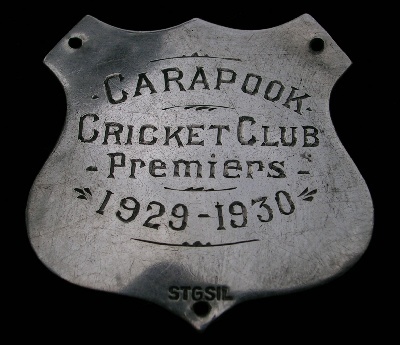 The small shield on the right, demonstrating Carapook's success in the 1929-30 cricket season, was found recently and has probably fallen from the Casterton & District Cricket Association Premiership Trophy. After 44 years' cricket, 28 with Carapook, Alan "Mailey" Povey, Carapook, has announced his retirement. The announcement was made at a party to celebrate his 50th birthday anniversary. "Mailey" - he got the nickname from Test star, Arthur Mailey - started cricket with Carapook School when he was six and played for Carapook when he was 15. He was a regular player for that club until he went overseas with the army during the War, where he spent four years. Even war could not stop "Mailey" playing, and while overseas he was a member of his unit team. In one of the opposing teams was Test Opener Arthur Morris. As Carapook team did not reform for two years after the war he played for Bahgallah one year and Sandford the next. He played for Carapook from 1948 until 1958. This season according with a war-time promise he played with RSL. A slow left arm spinner, he has some amazing figures, best of which was 9/0 against United some years back . In that match he took 6/6 in the first innings, and 9/0, to finish the match with 15/6. His nephew Roy took the other wicket in the second innings. He has taken the hat trick on several occasions, including once in the Army at Lae [New Guinea]. Against Casterton several years ago he took four wickets with four successive deliveries. In 1928 he won a trophy for most catches for the season, but cannot remember how many he took. As a batsman "Mailey's" best score was 53 against Merino - "but that was along time ago", he hastened to add. The Povey family are a cricket family, and last year fielded a cricket eleven which played a match against Tahara. "Mailey" has two sons, Daryl and Bruce, who are members of the new Casterton Junior Association. Dad is an umpire and coach in the Junior Association, and this season gave the trophy for the highest score. Asked if he really would give the game up, "Mailey" replied, "Yes - unless, of course, Carapook are short of a man sometimes." 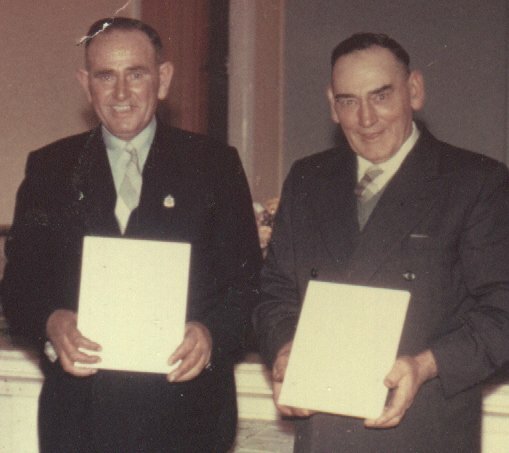 Alan "Mailey" Povey (left) Les Anson (right) at the presentation of their Life Membership Certificates by the Carapook Cricket Club. Les was married to Alan's elder sister May Povey and provided the land opposite the Carapook School as the home ground for the Carapook Cricket Club.